Trained by Todd Pletcher for owners Madaket Stables, Elayne Stables and Brian Martin, the 4-year-old daughter of Include settled at the back of the six-horse field, sitting just outside of mutuel favorite My Miss Lilly as Frostie Anne set the opening quarter-mile in 24.05 seconds on the muddy main track. Frostie Anne continued to widen her advantage down the backstretch, marking the half-mile in 47.91 with Jump Ruler following five lengths back. Another Broad and My Miss Lilly, last year's Grade 2 Gazelle winner, launched their bids approaching the final turn with the latter finding an inside path while Another Broad looped outside rivals before angling back inside. A game and determined Frostie Anne maintained her lead at the top of the lane as Forever Liesl rallied wide and My Miss Lilly pressed forward from the inside with Another Broad picking up steam. Another Broad continued to find more with swift strides late in the lane, finding a seam between Frostie Anne and My Miss Lilly, and powered past her rivals to secure a 1 1/4 length victory. Forever Liesl arrived in time to complete the exacta, three-quarters of a length in front of My Miss Lilly. Frostie Anne, Midnight Disguise and Jump Ruler completed the order of finish. Another Broad, earning her first stakes victory, covered nine furlongs in 1:52.99. Franco said the swift tempo set by Frostie Anne made all the difference. The Maryland-bred Another Broad was purchased privately in November out of a runner-up score in the restricted Geisha at Laurel Park and finished fourth in the Grade 3 Royal Delta on February 19 at Gulfstream Park when making her first start for new connections. 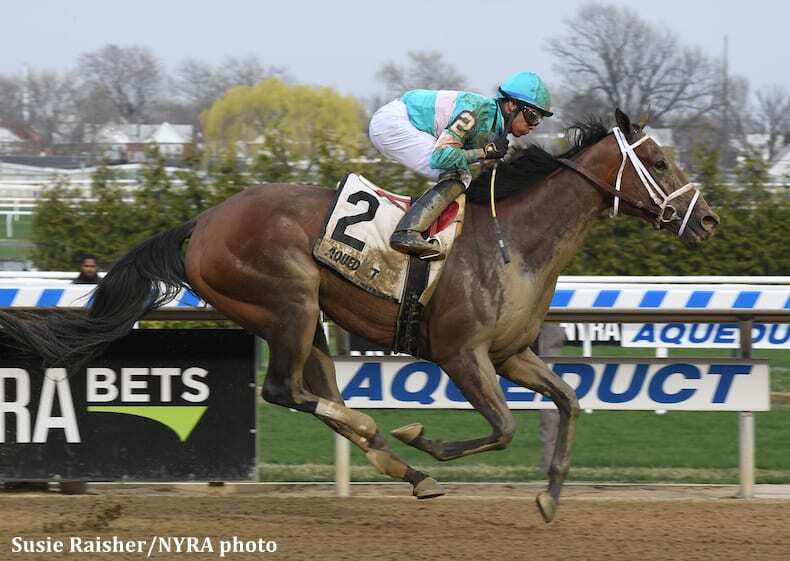 Another Broad prepared for her New York debut at Pletcher's winter base in Florida. Eric Cancel, aboard runner-up Forever Liesl, praised Franco for the deft winning move. “I had a really good trip. I was placed where I wanted to be. I didn't really expect Franco to come in between horses. He had the hole and he went for it and he came out victorious,” said Cancel. Another Broad, bred in Maryland by Fitzhugh LLC, banked $110,000 in victory while improving her record to four wins and two seconds from nine starts. She paid $11.40 on a $2 win wager. Live racing returns at the Big A on Sunday with a nine-race card highlighted by the $100,000 Plenty of Grace in Race 3 and the $100,000 Mizdirection in Race 8. First post is 1:30 p.m. This entry was posted in Racing and tagged another broad, aqueduct, include, manny franco, todd pletcher, top flight invitational by Keith McCalmont/NYRA. Bookmark the permalink.